Similarly, when asked whether a democratic government or a leader with a strong hand could best solve the country’s problems, only 38% choose the former, down from 61% two years ago. 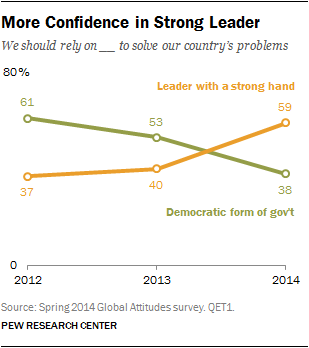 Meanwhile, the share of the public favoring a strong leader has risen from 37% to 59%. Still, despite waning confidence in democracy’s ability to produce results, Tunisians continue to want key features of a democratic system, such as a fair judiciary, competitive elections, the right to protest and equal rights for men and women. At least part of the public’s discontent is explained by economics. Fully 88% describe the country’s economic situation as bad, and 56% say it is very bad. But a majority is optimistic that the economy will turn around soon – 56% expect it to improve in the next year. These are among the major findings from the latest survey in Tunisia by the Pew Research Center, based on face-to-face interviews conducted with 1,000 respondents from April 19 to May 9, 2014. The poll also finds declining popularity for Ennahda, the moderate Islamist party that led a coalition government after the fall of Ben Ali. Though the former ruling party is expected to do well in the October parliamentary elections, just 31% express a favorable view of the organization, down from 65% in 2012. Ratings for key Ennahda leaders have also fallen since the revolution. Only 33% view longtime party leader Rached Ghannouchi favorably, compared with 66% two years ago. Similarly, support for Hamadi Jebali, a former Prime Minister from Ennahda, has dropped precipitously since 2012 – 66% rated him positively then, compared with just 43% in the current survey. Ratings for Ettakatol and the Congress Party, two leading secular parties, have also declined over the last two years. And most of the Tunisian political leaders tested on the survey receive mostly negative reviews. The two exceptions are caretaker prime minister, and political independent, Mehdi Jomaa, who is viewed positively by 81% of Tunisians; and Beji Caid Essebsi, a former prime minister and leader of the secularist Nidaa Tounes party, who is seen favorably by 51%. Many observers expect Essebsi and his party to do well in upcoming elections. About half of Tunisians (48%) believe that democracy is preferable to any other kind of government, with about a quarter saying that in some circumstances a non-democratic form of government is preferable (26%) or that the type of government does not matter (24%). Support for democratic governance is down from the 54% who said it was preferable in 2013, and the 63% who said the same in 2012. There is a significant age gap on preference for democracy. Only 43% of Tunisians between 18 and 29 think democracy is preferable, while more than half of those 50 and older (54%) hold this view. Younger respondents (30%) are more likely than older people (18%) to say that the type of government they have does not matter to them. Preferences for democracy also differ by religiosity among Tunisian Muslims (estimated to be greater than 99% of the population). About half of those that pray five times or more per day (52%) say that democracy is preferable, compared with 41% of those who report praying less frequently. Similarly, supporters of the main Islamist Ennahda party are more favorable toward a democratic form of government. A majority of Tunisians (59%) now say they should rely on a leader with a strong hand to solve their country’s problems, up 19 percentage points in just a year. Roughly four-in-ten (38%) believe that a democratic form of government is the best solution to the mounting challenges Tunisia faces, a substantial decline from 2013 when more than half (53%) said democracy was the best way. Following Ben Ali’s ouster, 61% thought a democratic form of government was preferable to a strong leader. When asked to weigh the importance of a good democracy versus a strong economy, 73% of people express the opinion that a strong economy is more important, a significant increase from last year and a 14 point jump in two years. 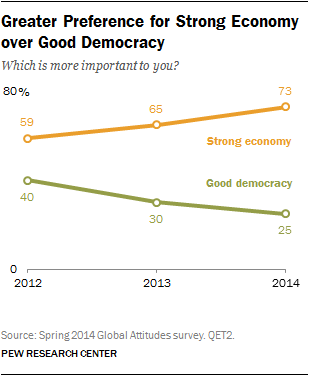 Just a quarter prioritize a good democracy, down steeply from 2012 when 40% said a good democracy was more important. Respondents with a post-secondary education (35%) are more likely than those with a primary school education or less (23%) to say that having a good democracy is most important. When asked which is more important, having a democratic government with some risk of political instability, or a stable government with a risk it will not be fully democratic, 62% of Tunisians say they prefer stability. 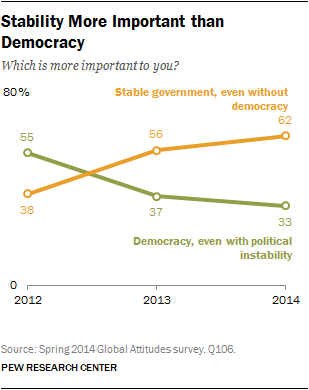 This has increased dramatically since 2012 when just 38% said they would prefer stability over democracy. After the political turmoil of the last two years, only a third say that a democratic government is worthwhile, even if there is instability, down from the majority (55%) who believed the same in 2012. Women are much more likely to prioritize stability. Nearly seven-in-ten women (69%) express that a stable government is more important than a democratic one, while 55% of men say the same. Although there is widespread discontent with democracy, Tunisians say they value many key features of a democratic system. Strong majorities believe that all of the democratic rights and institutions included on the survey are at least somewhat important to Tunisia’s future. More than nine-in-ten believe that having a judicial system that treats everyone in the same way (94%) is very important for the country’s future, up 13 points since last year. Similarly, 92% of Tunisians say having honest, regularly held elections in which people have a choice of at least two parties is very important, an increase of 21 percentage points in just a year. Nearly all Tunisians (96%) say that improved economic conditions are very important for Tunisia’s future, up nine percentage points from last year’s substantial 87%. Law and order is a priority for most Tunisians – 81% believe that stability is crucial for Tunisia’s future. More than six-in-ten also think that the freedom to peacefully protest (68%), equal rights for women (66%), freedom to criticize the government (64%) and an uncensored media (63%) are critical for Tunisia’s future. Tunisians are less likely to express the view that allowing religious parties to participate in government is essential for the country. About half (48%) say that this is very important. Ennahda supporters are much more likely to believe this – 58% say that allowing religious parties is very important, compared with 43% of those who give Ennahda low marks. Though most of these democratic values are shared across Tunisia, the greatest disagreements are about the importance of religious parties and women’s rights for Tunisia’s future. Perhaps unsurprisingly, support for allowing religious parties in government is higher among more religious Tunisians. Two-thirds of those who believe laws should strictly follow the teachings of the Quran believe that allowing religious parties to be a part of government is very important for their country’s future, while just 41% of those who say that the Quran should have a moderate or no influence on laws believe the same. Similarly, roughly half (52%) of Tunisian Muslims who pray five or more times a day agree that allowing religious parties to be a part of government is very important, compared with 43% of those who report praying less than five times a day. Additionally, Tunisians with lower levels of education (52%) are more likely to say that religious parties are critical compared to their more educated counterparts (39%). Meanwhile, views about gender equality vary substantially by gender. More than three-quarters of women (78%) say that it is very important for the country’s future that women have equal rights, while just 55% of men say the same. The majority of Tunisians believe that Islam should play at least some role in their government. 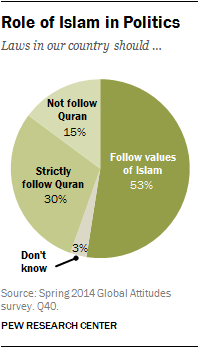 More than half (53%) say that laws should follow the values and principles of Islam, but not strictly follow the teachings of the Quran. Three-in-ten believe that laws should strictly follow the teachings of the Quran, while 15% believe laws in Tunisia should not be influenced at all by the Quran, which is relatively unchanged over the last year. Muslims who pray five times a day or more are especially likely to believe the Quran should play a strong role in Tunisian government. More than a third of this group (37%) believe laws should strictly adhere to the Quran, compared to just 21% of less religious Tunisian Muslims. Backers of Ennahda (39%) are also more likely to say that laws should strictly follow the Quran than its opponents (26%). A broad majority of Tunisians (81%) express dissatisfaction with the way things are going in their country. Fewer than two-in-ten (17%) say they are satisfied with the country’s direction. Just 13% of 18-29 year olds are satisfied, while slightly more of those 50 and over (24%) express satisfaction with national conditions. Nearly nine-in-ten Tunisians (88%) say the current economic situation in their country is bad, including 56% who believe the economy is very bad. Perceptions of economic conditions in Tunisia, where GDP growth has slowed recently, have been quite negative since the 2011 revolution. However, people are slightly more optimistic when it comes to the country’s economic future. A majority (56%) now believes that the economic situation will improve over the next 12 months, up six percentage points from last year, while 18% think the economy will worsen and 21% say it will remain the same over the next year. Despite the increase since last year, economic optimism has not yet returned to initial post-revolution levels when 75% of Tunisians expected economic improvement. Optimism about Tunisia’s economic future differs among key groups. Older Tunisians have a significantly more positive outlook than their younger counterparts. Nearly two-thirds of Tunisians age 50 or older (64%) are confident that the economic situation will improve in the next 12 months, compared with just 48% of 18 to 29 year olds. This greater negativity may not be surprising given recent estimates of an unemployment rate of 38% for young Tunisians (15 to 24 year olds), more than twice the rate for the country’s overall population. Additionally, women are significantly more optimistic than men about the Tunisian economy, with six-in-ten women believing the economy will improve in the next year compared with 51% of men. Roughly half of Tunisians (51%) say that the recent years of revolutionary turmoil have left the country worse off than it was under Tunisia’s long-time ruler, Zine El Abidine Ben Ali. Only 35% say Tunisia is better off, a view virtually unchanged from 2013. Tunisians with a post-secondary education (44%) are considerably more likely than those with a primary education or less (30%) to say that the country is better off without Ben Ali. Similarly, 45% of people with higher incomes say the country is better off following Ben Ali’s ouster, compared with 27% of lower income Tunisians.1 Additionally, men (40%) are more likely than women (30%) to believe the country is better off without Ben Ali. Tunisians show overwhelming support for Prime Minister Mehdi Jomaa, a newcomer to national politics who took office in January 2014. 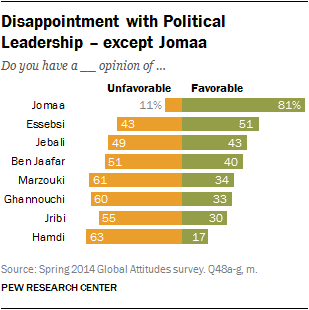 Roughly eight-in-ten (81%) express a favorable opinion of Jomaa, while just 11% give him a negative rating. About half (51%) also give a favorable rating to Beji Caid Essebsi, chairman and presidential candidate for the secular Nidaa Tounes party, up 10 percentage points since last year. While Jomaa receives very positive ratings, public opinion of other politicians reflects the disappointment in national leadership during Tunisia’s democratic transition. Hamadi Jebali, the former Ennahda prime minister, has seen a substantial dip in popularity since leaving office. In 2012, 66% of Tunisians gave him a favorable rating. Today, just 43% give him positive marks. Approval of Interim President Moncef Marzouki has also declined. Roughly a third (34%) expresses favorable opinions of the Congress for the Republic party’s founder, a drop of ten percentage points over the last year. Tunisians also give lackluster ratings to President of the Constituent Assembly Mustapha Ben Jaafar, Ennahda party leader Rached Ghannouchi, Secretary-General of the Republican Party Maya Jribi, and Secretary-General of the Party of Progressive Conservatives Hachmi Hamdi, on par with their ratings in 2013. Tunisians are markedly unhappy with the political organizations at the center of the country’s struggle toward democracy over the last three years. Of all the organizations included in the survey, the one that fares the best is the Tunisian General Labor Union (UGTT), a powerful group credited with brokering a deal to help jumpstart the stagnated post-revolutionary transition last fall. More than half (53%) express a favorable opinion of the long-standing organization, while 37% rate it negatively. All other political organizations garner less than a third of favorable responses. Ennahda, the moderate Islamist party that took heat for being unwilling to share power after winning Tunisia’s first free election, receives slightly more support than others, with positive ratings from 31% of Tunisians. While Ennahda accrues the greatest amount of negativity (64%), it also has the greatest recognition of all the political parties tested. The organization’s favorability has declined precipitously over the last two years, falling 34 percentage points since 2012 when 65% of Tunisians held a favorable opinion of the group. Ettakatol, also called the Democratic Forum for Labor and Liberties, and the Congress Party for the Republic garner similar scores. Only about a quarter of Tunisians (26%) rate these groups favorably, while a majority express unfavorable opinions of them. Both secular, center-left parties have seen similar declines in their favorability of roughly 20 percentage points since 2012 (22 points for the Congress Party and 18 points for Ettakatol). A quarter of Tunisians supports the Republican Party, a liberal, secular opposition party. Just over half of Tunisians (53%) give the Republican Party negative marks, little changed since 2013. Despite the substantial portion of Tunisians that believe they are worse off since the Jasmine Revolution, opinions of Tunisian institutions are relatively mixed. Fully 95% give the military positive ratings. The police also receive high ratings, with 82% support in 2014, up from 71% last year. Six-in-ten or more also believe financial institutions (62%), the media (62%) and corporations (60%) have a good influence on the way things are going in Tunisia. Roughly half (52%) of Tunisians give the national government high marks, while just 41% rate the government negatively. Prime Minister Jomaa, the leader of the current caretaker government, receives some of the highest support. Roughly three-quarters of Tunisians (77%) believe he has a good influence on the country. Just 15% give Jomaa negative ratings. People have more mixed reviews of trade unions (45% good) and the court system (44%), on par with 2013. Attitudes toward civil servants are also split with 49% seeing them as good. Receiving some of the lowest marks are Tunisia’s religious leaders. Just a third rate religious leaders favorably, falling 11 percentage points since last year, and a full 17 points since 2012. Three-in-ten or fewer say that President Marzouki (30%) and the Constituent Assembly (28%) have a good influence on the country. While public opinion of the Assembly, which approved Tunisia’s new constitution earlier this year, has improved over the last year, it has not returned to the higher ratings it enjoyed just after its creation when 45% of Tunisians gave it high marks in 2012. Young people and the highly educated are generally more critical of national institutions. People age 18 to 29 are less likely than those 50 and older to express favorable ratings of the national government (41%), Prime Minister Jomaa (71%), the Constituent Assembly (22%) and the media (57%). Individuals with post-secondary education express considerably less positive views of the media (45%), religious leaders (18%), the court system (34%), civil servants (36%), the police (70%) and trade unions (31%) than those with a primary education or less. People are split over whether their current government is doing enough to ensure that women have the same rights as men. Roughly a third (31%) believes the government is doing the right amount, up eight points in the last year. Similarly, fewer people say the government is not doing enough (37%) than last year when 51% said this. Around two-in-ten (18%) said the government is doing too much for women’s rights, the same as last year. Young people are more likely to be dissatisfied with the government’s efforts to protect the rights of women than their elder counterparts – 46% of those 18 to 29 believe the government is doing too little, while just 27% of those 50 and over say the same. However, there is no significant gender divide on this question.